As threatened, the Mets recalled the six men below in time for yesterday’s rainout. New arrivals Kelly Stinnett and Phillip Humber were dressed in Nos 36 and 49, respectively. (Thanks to readers Lou and Michael for the updates). Both numbers have been issued previously this season: Henry Owens wore 36 during his brief callup and 49 belonged briefly to Roberto Hernandez before he could pry 39 from Pedro Feliciano. In addition to being the digits favored by knuckleballers, 49 tends to be a relief pitcher’s number for the Mets — you have to go back until 1984 and Walt Terrellto find a regular starter who wore it, though Humber for the short term looks destined for spot-starts and relief work anyway. Stinnett, who wore 33 for the Mets in 1995, becomes the latest member of the two-time Met club. 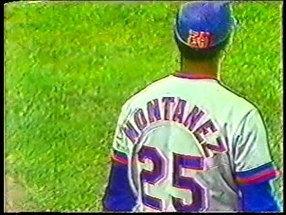 Willie Montañez — I know the ñ is definitely part of his family name, but I’m not entirely sure whether the team sewed the tilde on too. Somebody told me that the Mets only started sewing names on their uniforms in 1979, and so that left only part of that season where Willie could have sported a tilde as a Met. Are there any pictures to prove it one way or the other? 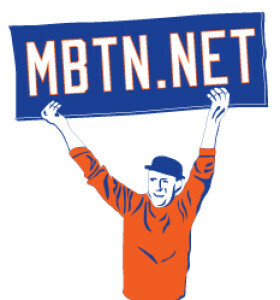 Though we doubt we’d find a tilde if we found a picture (the ’79 Mets, like this site, were lazy with that kinda thing), we haven’t found a picture. Can anyone help?